This diary feature is designed to complement the latest bird news section, and it may occasionally be entertaining although I make no promises. After having updated the Iceland Birding website every day for more than a year I came to realise that the birds entered under the "Rare Bird News" section in no way reflected the birding Iceland experience, and I began to wonder whether I should launch yet another birding blog. The final straw came a couple of weeks ago when birding in SW Iceland with three others. We stopped to watch a juvenile Gyr Falcon sitting very close to the car. Suddenly one of my colleagues spotted a Eurasian Curlew behind it and shouted, "Hey, look a Curlew!" 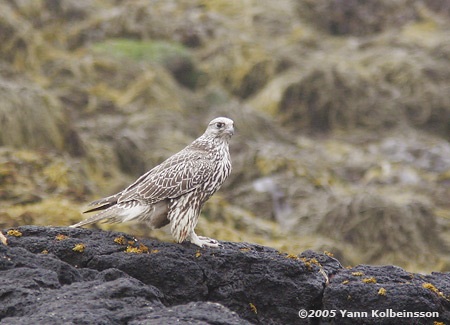 Immediately all Icelandic eyes were turned to the Curlew, a scarce bird in Iceland, far rarer than a common and garden Gyr Falcon. I can't imagine many other places where the locals would drop a Gyr Falcon like a hot potato for a Curlew. But later that evening I was duty bound to enter the Curlew in the rare bird news, whilst making no mention of a close encounter with the world's largest falcon. So I'm keeping this diary to give a more complete picture of what birding's like season by season at this edge of Europe.